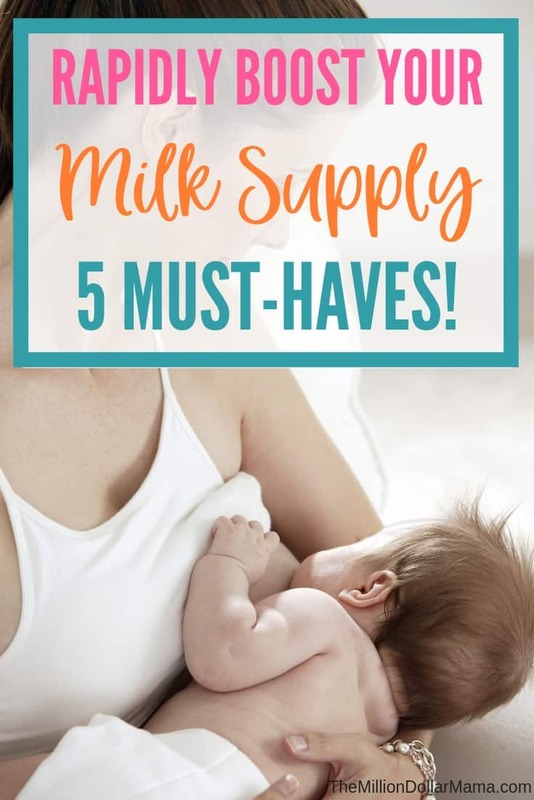 If you’ve made the decision to feed your baby breast milk, either through pumping or breastfeeding, it’s incredibly frustrating and stress-inducing when your milk supply is low. You want nothing more than to feed your baby breast milk but it seems like your own body is working against you by not supplying enough. The Breastfeeding Handbook is only $9 and it is going to be your bible when it comes to breastfeeding. It includes a 20-page handbook, printable worksheets, graphs, diagrams, pictures, tips and tricks – essentially everything you’ll need to be successful in your breastfeeding journey. Ok, now that you’ve got your breastfeeding bible, let’s talk about products that boost your milk supply. If you want to try your hand at making lactation cookies then by all means, go ahead. The least that’ll happen is that you’ll hopefully have some delicious cookies to eat and they may even boost your milk supply. But if you don’t want to go the DIY route, or you want to try something extra, then I recommend the following. Fair warning – this stuff tastes absolutely repulsive. However, it’s been touted by many breastfeeding moms as a miracle for boosting breast milk supply. Birthsong Botanicals Let There Be Milk was specially formulated by a midwife, and contains a blend of trusted herbs that are known to increase breast milk production, including fenugreek, organic blessed thistle, red raspberry leaf, goats rue and marshmallow root. To combat the taste, I recommend not dropping the drops directly into your mouth. Instead, mix a few drops in a shot glass of water or orange juice, or mix them in with a teaspoon of honey. Sipping on a cup of warm tea is an excellent way for new moms to relax, and even better if it can help to drastically improve your breast milk production. There are tons of teas out there that promise to increase your milk supply, but one of the highest rated and most popular is Pink Stork Liquid Gold. Pink Stork Liquid Gold tea contains a blend of 7 organic herbs which have been scientifically proven to improve milk supply. The tea actually tastes good too, especially if you add a bit of honey to it. Pink Stork is a women-owned company started by a mom of 5 and military spouse who wants to help other moms experience the benefits of natural, organic products, so if you love supporting small, women-owned companies then you’ll love Pink Stork. If you want to try the route of lactation cookies but don’t want to make your own, then definitely try these Milkmakers Lactation Cookie Bites. They come in three flavors – oatmeal raisin, chocolate salted caramel and oatmeal chocolate chip, and they taste as good as they sound. What I love about these lactation cookies is that beyond containing ingredients that are known to boost milk supply, they also contain ingredients like flax seeds, which provides omega-3 fatty acids which are essential for infant brain development. The nutrients you consume pass through to your breast milk, so the fact that the Milkmakers Lactation Cookie Bites contain such nutrient-dense ingredients like flax seeds, oats, brewers yeast is a huge added bonus. All of the 3 milk-boosting must-haves I’ve listed so far contain fenugreek, which is a known milk-boosting powerhouse. So it stands to reason that you probably should be taking fenugreek capsules as well. There are dozens of fenugreek supplements on the market, but I recommend these Mother’s Select Fenugreek Capsules. They are 100% organic, and extremely high potency. Some people say that their milk supply doubled in just two days, which is pretty incredible. And Mother’s Select stands by their product so much that they even offer a full money-back guarantee, so there’s really nothing to lose. It contains no artificial colors or flavors, but it does contain fenugreek, blessed thistle and anise, which are all known to increase breast milk supply. If you don’t want to drink this straight, you can even just put a scoop in a smoothie in the morning.